Real stories and life lessons from people that have lived them. I stopped by to check it out on a recommendation and couldn't stop listening! You'll enjoy this show too. Even if this show is for men, I'm glad that I discovered this podcast so that I can share it to my audience. It is such a refreshing place to remind everybody to be grateful everyday for the life we have. Positive mindset, wisdom and great interviews all rolled into one motivational package. I don't know how Wally does it, 3x a week. These are great stories and indeed the Pay it forward concept is awesome! Thanks Wally! I know this is for men, but Wally is my neighbor and I promised to listen to it. Really enjoy these. Very motivating and inspiring. Can't wait to hear more! I never thought I would see the day that a show would come out in any form of media that is designed and targed at men. I am glad that someone was able to step and out and due a show like this. Women may have Oprah but guys have Wally. Inspirational show! check it out! I love the topics that Wally touches upon. This show will make you want to be a better person! It did me! So thrilled to see content of this nature in the podsphere. NICE! And necessary! What Wally is doing is remarkable. To have a podcast dedicated to the wellbeing and honor of men who refused to follow the standard path is breath taking. Keep doing what you're doing Wally! Great show! Keep it coming! Such a great podcast and I enjoyed hearing the guest's perspective. Really looking forward to listen to more episode. I like what I've heard and where this podcast is going, great job Wally! I'm always looking for sources of inspiration and this is clearly one of the best. Real men, real stories. I love it!! I'm excited for your show and can't wait to hear more! Congrats Wally! I'm all about perspective, mindset, and abundance. The hard part is maintaining it through life's lessons. I love how this podcast helps me do just that. It's useful through the good and the bad and will keep me honest. Thanks Wally for stepping up and hosting such an influential show. Great start to the show, Wally. Love your energy and commitment. Great episodes so far and looking forward to hearing more! Fantastic new podcast for people that want to change their mindset and learn actionable and applicable knowledge and skills to live a life of abundance! I’m a big believer in giving back and so I’m loving this podcast! The interviews are great and it inspires me to do and be better! Wally, Thank you for creating this culture and community. I love the idea of a community of people who live an abundance lifestyle. Keep up the great work and you gained a subscriber!!! Men of abundance is a must for men! Really enjoyed these first episodes! Great stories. Can’t wait to hear more. This is a great initial start for this podcast. The intro and outro are well done and I think they really set the tone for the future of this podcast. Great interviews with Vidal Cisneros and Patrick Snow, both very accomplished men who inspire those who listen to this. Would love to see some Q&A from MoA members. This could be put out in advance before the show is casted so that Wally can get that Q&A from the anticipated guest. I will review again in the future as I watch this podcast progress. Transformational Education and Leadership Development! Education is so important. Transformational Education is vital to your development as a leader and especially an Abundant Leader and Man of Abundance. Today, Aaron Hendon and I are going to share with you a conversation about Transformational Education. Aaron Hendon is a Seattle Realtor, real estate investor, author, educator and speaker. He is managing partner of Christine & Company, a Seattle Magazine awarded, Five Star Real Estate Agent, winning team for the past 5 years and individual Rising Star in Seattle Real Estate winner this year. 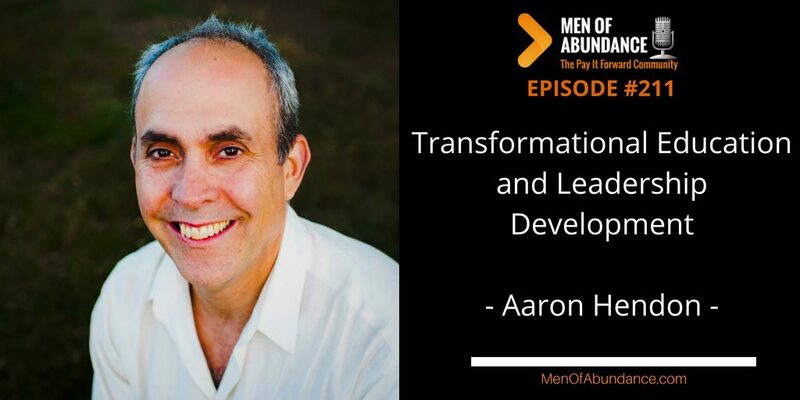 Inside his commitment to make a real difference for people, Aaron has also been leading transformational educational seminars and leadership development programs since 1995. Born in New York, Aaron graduated SUNY Purchase with a BFA in 1997. Discovering his fine art degree made him eligible to work in the food service industry anywhere in the country. Moving to New Mexico immediately after school, he eventually found his stride, opening a real New York bagel shop in Albuquerque, selling it 9 years later as a business grossing over $1,000,000 annually. Eventually landing in Northwest in 2000, he now lives on a small island off the coast of Seattle with his brilliant wife, Kael, his two brilliant children, Leela (14) and Jonah (11) and his adoring, if not exactly brilliant, Golden Doodle, Rozy. Watch this video “Everything You’ve Ever Learned About Generating Leads And Growing Your Business Is Wrong!” This video is 73 min long. But it will be time well spent. I promise.